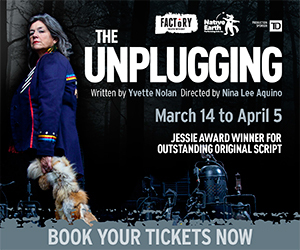 The first production in our 2014-2015 Season, sees Native Earth partnering up with Factory to bring audiences The Unplugging by Yvette Nolan. Over the next few weeks, we will introduce readers to key players in this production and partnership. 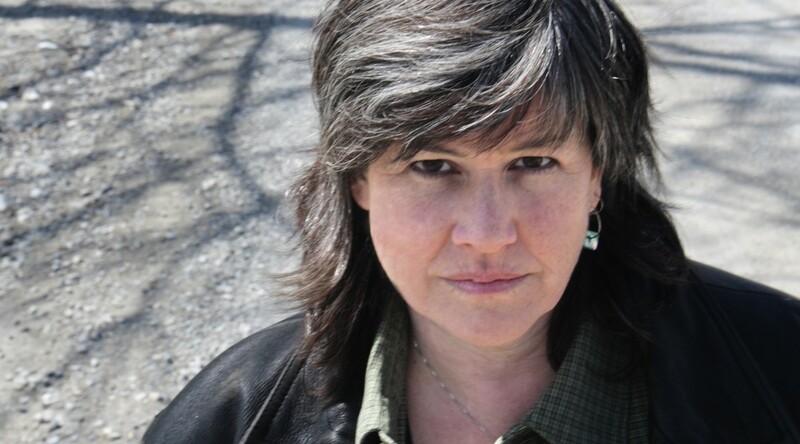 Today we begin with the person without whom there wouldn’t be a play: Algonquin playwright Yvette Nolan. Not only is Nolan an award-winning1 playwright, director, dramaturg3, and recognized community leader2, but she also led Native Earth Performing Arts as Artistic Director for eight years from 2003-2011. 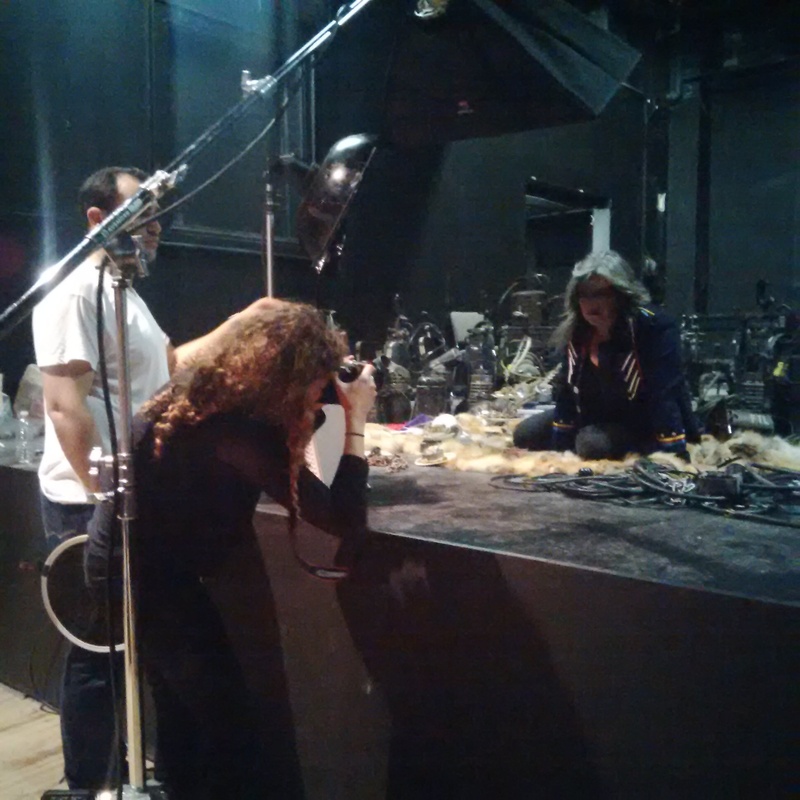 Photographer Bronwen Sharp and her assistant with Yvette Nolan at The Unplugging photo shoot. Nolan was inspired to write The Unplugging after the passing of her mother. Feeling that she hadn’t learned enough from her mother, and inspired by an Athabascan legend, Nolan took only three months to pen the play about two aging Indigenous women4. Making its Toronto debut at Factory’s mainspace March 14 – April 5, 2015, The Unplugging follows the women, exiled from their village and wandering a desolate landscape after all power has simply disappeared. It’s not long in this new life before the women encounter a young man and need to make some crucial decisions. The partnership between Native Earth and Factory is just one of many reasons to be excited about this particular production. Led by Director and Factory Artistic Director Nina Lee Aquino, the production features a cast and design team Nolan stands behind. Sound Designer Romeo Candido at the first read-through. Nolan is Past President of the Indigenous Performing Arts Alliance, currently serves on the board of the Saskatchewan Arts Alliance and Word On The Street Saskatoon Chapter, and her book Medicine Shows, about Native theatre in Canada, will be published in the spring. Next for Nolan is the Banff Playwrights Colony to work with Michael Greyeyes on his theatre-dance piece Nôhkom, then Saskatoon for Short Cuts, a festival of 10-mintues plays. Following which she’ll direct Falen Johnson’s Two Indians. Finally she is co-curating The Study on Manitoulin Island with Sarah Garton Stanley for the National Arts Centre. I guess the bigger question is what do I do? I cobble together a life in the theatre. For me, my success has largely been dependent on doing things for the right reasons, which for me is not money. Whenever I do things for the wrong reasons, the universe smacks me upside the head so fast. So, the advice: figure out your reasons, your values, and make decisions accordingly. Also, Warren Zevon told David Letterman, not me, “enjoy every sandwich” but I was listening and I took it personally. like the student at Dalhousie, or Lucy DeCouture. Eeeeeh, first? I have done everything. Hung lights during university to support myself. Lay dance floor. Built props. Stage managed. Built sound tapes, on reel-to-reel, no less. Don’t remember what came first. we need to engage audiences. Oh my, I would love to sing like Michelle St John. The Yukon. My heart home. and instead review what they think they should be seeing. My mom, the late Helen Thundercloud, who survived tuberculosis (twice), residential school (two), divorce, a fire, to become a young elder who moved so many of us to try to know. She says, “Irreducible”. Then she admits she is cheating. Cheese. A hard one, a soft one and a blue one. If you were a breakfast cereal which would you be? I am SO steel-cut oats. Jesus or Shakespeare or Elizabeth I. How would you title your memoir? Because my first professional gig onstage was playing the dead body in Joe Orton’s Loot, I thought I would title it Playing Dead, but after 30 years in the biz, I think perhaps I will call it If You Want Me I’ll Be In The Bar (a nod to Joni Mitchell’s A Case of You). Plays by Yvette Nolan include BLADE, Job’s Wife, Annie Mae’s Movement, Scattering Jake, Ham and the Ram, The Unplugging, The Birds (a modern adaptation of Aristophanes’ comedy), the text for from thine eyes (Signal Theatre), Prophecy (Canada 300/Watermark) and Alaska, which was part of the hugely successful inaugural Short Cuts, produced by her company Hardly Art with On The Boards in Saskatoon. Directing credits include Salt Baby by Falen Johnson (Globe Theatre), Justice by Leonard Linklater, Café Daughter by Kenneth T. Williams (Gwaandak Theatre), Tombs of the Vanishing Indian and The Unnatural and Accidental Women by Marie Clements, Salt Baby, A Very Polite Genocide by Melanie J Murray, Death of a Chief, Darrell Dennis’ Tales of An Urban Indian, Annie Mae’s Movement (Native Earth Performing Arts), The Ecstasy of Rita Joe (Western Canada Theatre/National Arts Centre), Yoga Cannibal (Jungalee Gal Productions), The Only Good Indian… and The Triple Truth (Turtle Gals). 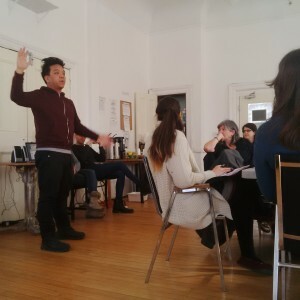 Recent dramaturgy includes Heather Morrison’s Thicker Than Water (Sum Theatre), Tara Beagan and Michael Greyeyes’ A Soldier’s Tale (Signal Theatre), Adam Pottle’s Ultrasound (Saskatchewan Playwrights Centre), PJ Prudat’s Reunir (Saskatchewan Native Theatre Company).